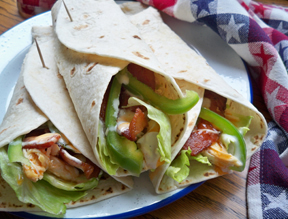 Buffalo chicken combined with bacon for a tasty touch of heat wrapped in a tortilla shell. You can't beat the savory flavor created with this combination. 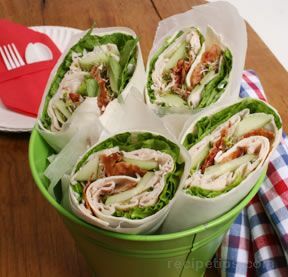 This wrap is perfect for a weeknight meal or a summer get-together with friends. Fry bacon, drain, and set aside. Cut chicken into 1-inch strips. 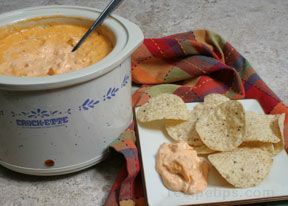 Place in a saucepan and add 1/2 cup of buffalo wing sauce. Stir chicken into sauce so it has been covered with the sauce. Bring to a boil and then turn heat down; simmer for 10 to 15 minutes, just until chicken is done. Remove from the heat and take chicken out of the sauce and place on a plate. Discard sauce in pan. Shred chicken and then set aside. While the chicken is cooking, prepare the lettuce by removing leaves to use for the wraps and cut the pepper into strips. 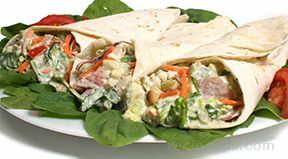 Once the ingredients are prepared, warm the tortilla shells and place a leaf of lettuce on each. Add the shredded buffalo chicken down the center and top with the bacon and pepper strips. Drizzle with Ranch dressing and the remaining buffalo wing sauce. Wrap up in the tortilla shell and serve. Note: You may want to let people add their own extra buffalo wing sauce just in case someone doesn't want the extra heat added to their wrap. "A very tasty wrap! My husband loved this. He likes spicey food and loves bacon. He added a lot more extra sauce than I did but I thought they were good too."